Envirofit India recently disseminated 145 clean cookstoves in Bhor, Maharashtra, on behalf of the BNI Pune East, CHAMPS chapter. Vatsala is one of the program’s beneficiaries, this is her story. 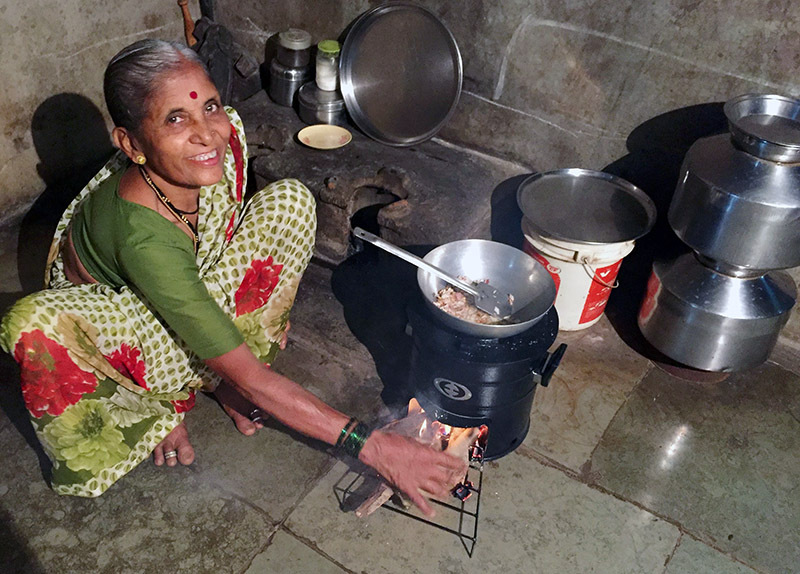 All Vatsala has ever pictured when asked to think of a ‘cookstove’ is the traditional mitti-ka-chulha. These traditional mud and brick constructions have always been used to prepare food – both in the village where she grew up, and in the one she entered as a young bride. There never was question of an alternative. Vatsala’s village is near the lush green fields that surround the Bhatghar Dam on the Yelwani River. Her pride in a keeping a spotless home is plain to see, and it belies the cataracts she has dealt with for over two years. When we visit, the mouth-watering aroma of freshly prepared food fills the senses. Her husband, village sarpanch (headman) Ramchandra Konde, notices our expressions as he invites us in. “Vatsala loves cooking,” Konde laughs. “And I love eating.” Vatsala nods in approval as he pats his stomach. As sarpanch, Konde is responsible for development in the village. He was among the very first to notice the benefits of Envirofit’s clean cookstoves. Vatsala picks up the story: “I didn’t realize when I was using the mitti-ka-chulha, just what the problem was at first. Vatsala continued: “I was struggling to see well for a long time and my eyes were painful, red and itchy when cooking. We finally went to the doctor, who told me I had cataracts. I was operated on a few months ago. My eyesight is still weak after my operation, but I still do my best to keep a clean home and cook and feed my family. They are important to me. “But not anymore,” Vatsala says with a smile lighting up her face. “I have a better cookstove to compare the traditional one with. The PCS-1 addresses 10 of the UN’s Sustainable Development Goals, and generates Gold Standard Carbon Credits. Achieve your CSR goals with the Envirofit PCS-1 Spandan – contact InfoIndia@envirofit.org today.